Some time ago, I stumbled across two such “rough diamonds” on Ebay. One auction had no other descriptor than “1920s-30s C.G. 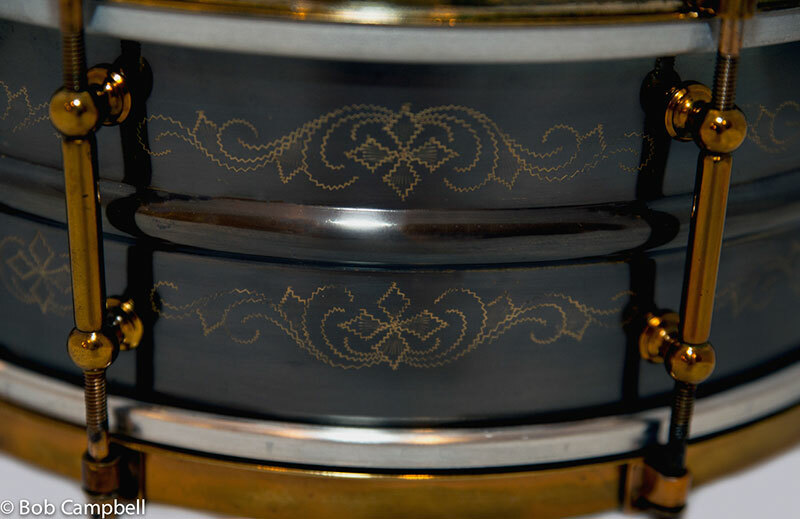 Conn 5X14 Brass Snare Drum.” I looked closely at the pics by eye and thought I saw some engraving on the shell. To examine it further, I downloaded the auction pics and zoomed in using Photoshop. Lo and behold, it looked like a 1920s C.G. Conn engraved Tuxedo with the characteristic four diamond cross pattern! The inside of the shell still retained the black nickel so I was pretty certain the outer black nickel plating had been removed. I won the auction for a very reasonable amount, so the thought of black nickel re-plating seemed like a worthwhile investment. When the drum arrived, my presumptions were confirmed. It was indeed an 8-tube lug, 1920’s Conn Tuxedo with “Made by C.G. Conn LTD, Elkhart, IN U.S.A.” stamped on the upper hoop, 4-screw “Presto-like” strainer, Knobby Gold hardware and shell engraving in beautiful condition. Next, I set about to do some research on what it would take to properly restore this drum. I needed to think long and hard about this, as it required additional investment and had to be done correctly if done at all. Meanwhile, another orphan drum serendipitously crossed my sights on Ebay. 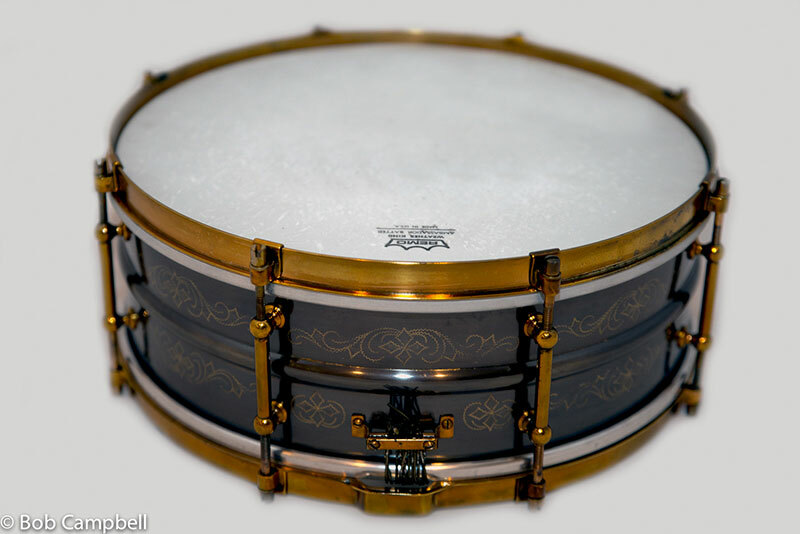 This time, the drum was clearly identified as a “1920s-1930s engraved Ludwig Black Beauty.” The early 1930s art gold hardware looked amazingly well preserved for its age: 10 brass tube lugs, timepiece strainer; smaller, more rounded snare gates, “Super-Ludwig” embossed on the bottom hoop in block letters. The logo engraved on the shell was somewhat unusual, reading “Ludwig – Trademark” rather than the usual “Ludwig, Chicago U.S.A.”, and bounded by a rectangular box (actually, a parallelogram as I was corrected by my daughter) one panel to the left of the strainer. The catch was that the engraving was thoroughly blackened with none of the brass visible. 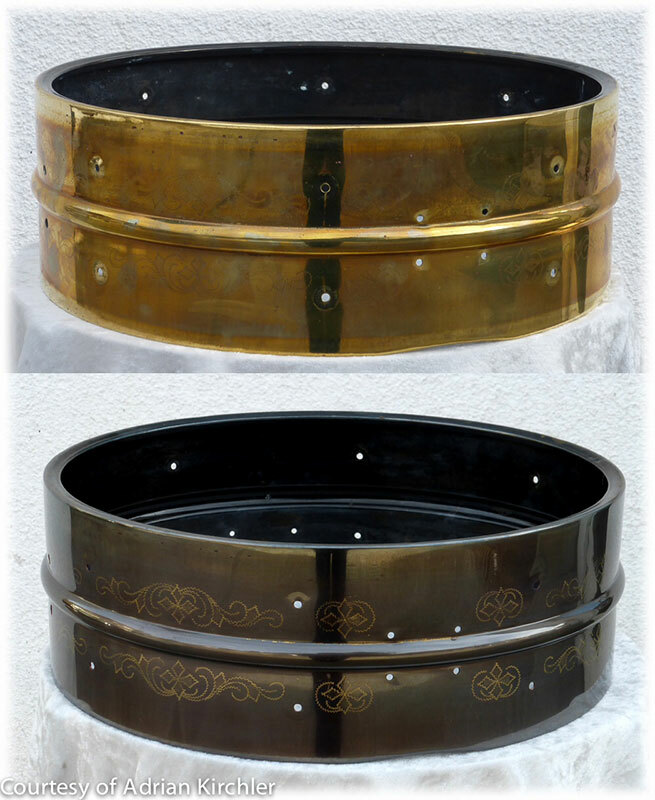 During its lifetime, the drum had either been painted black or poorly re-plated. I took a gamble and placed a winning bid, hoping that there was some original black nickel underneath. When I got the drum, I sent pics out to Mike Curotto and Harry Cangany for their thoughts on the shell. None of them could be certain from the pictures whether it was black paint or nickel. So off the drum went to Mike Curotto’s shop for closer examination. A short time later, Mike gave me the unfortunate news - the drum had been painted and no black nickel remained. This now left me with two wonderful vintage drums whose hardware was in great shape, the original engraving intact, but stripped down to the brass. I consulted Harry Cangany about restoration, weighing the concerns of valuation/devaluation vs. preservation. I finally came to the conclusion that these two drums needed to be brought back to life, to the way they looked in the 1920s and 30s (fortunately, Harry agreed ☺). This was not about vintage drum investment but more so about preserving our drum heritage. I was convinced re-plating was the right thing to do. So, I contacted the amazing drumsmith, Adrian Kirchler (“AK”), in Italy. I was aware that AK not only made great drums for Ludwig (100th Anniversary Triumphal) and Craviotto (AK/Craviotto Masters Metal series, 10th Anniversary Black Diamond) but also was the only craftsman in the world who could re-plate engraved drums and leave the engraving shining brightly through the black nickel. Mike, who had the drums in his shop, kindly sent them shells to Adrian for re-plating. Mike kept the hardware to polish/buff up and spray a coat of clear lacquer. As Mike says, “rust never sleeps." Many thanks to Harry Cangany, Mike Curotto and Adrian Kirchler who kindly provided guidance, encouragement and their talents to this project.